A macaron is a traditional French pastry from Nancy, a commune of the Meurthe et Moselle département, in northeastern France. Dating back to the 18th century, the macaron is made of egg whites, almond powder, icing sugar and sugar. This sweet pastry came out of the French courts' baker's oven as round meringue-like domes with a flat base. In the early 1930 the tearoom and pastry-shop Ladurée in Paris started selling the new creation of Pierre Desfontaines, grandson of Louis Ernest Ladurée: two traditional dome halves sandwiched with a sweet filling between: the ganache. This resulted in giving the new macaron  a larger size, the possibility of flavored garnishes, and a newfound moistness that came from the garnish. Whereas the traditional macaron was sweet and dry and crunchy, the new macaron had the added attraction of being delicately crunchy on the outside, while moist, chewy, and flavourful on the inside. Melbourne Food Bloggers seem Macaron Mad. I can't explain it. I just blame Duncan for blowing our minds with them at last year's Bloggers Banquet. But it seems to be a global affliction. My photo of those particular mini morsels still rate as one of the highest individually viewed images in my Flickr account. To date, it's had 75 views, about 100 less than the chart topping image of Gordon Ramsay's omelette recipe, but enough to make it a niche subject. The search for local perfection seems to end in Duncan's kitchen for some bloggers, but I have my local favourites. By chance I stumbled into David Menard's Noisette this morning after a ninety minute 7.30am workout and a detour to South Melbourne Market - yes, on a Sunday and the sun was rising when I began - crazy. At the shop there were 20 pastel morsels on the counter. 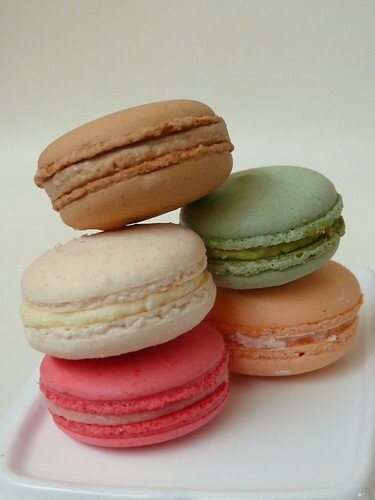 To me they're much prettier than the Pierre Herme Macarons everyone seems to swoon over. I took five - pictured - presuming that Guillaume Brahimi had probably either been short changed or that extras had been made. I also walked out with two croissant to further undermine my diligent physical exertions. So how did they taste? A crisp smooth shell gave way with a gentle shattering to a strongly flavoured, soft and airy yet finely granular almond cake. Then the sensuously creamy filling creeps across your palate, giving a silky finish to the experience. C'est magnifique - vraiment! Noisette also had a number of new puff pastry based tartes on the counter. Gorgeous glistening, golden rectangular slices with various toppings cut from a rather long mother tart. I must give them a shot soon. So Duncan, this is pour toi cheri. His posts about Macarons, including recipes and helpful guidance for mastering the technique via the comments section. Wow. They certainly look like the best in Melbourne. Monsieur Menard is welcome to contact me when next there is an intention to make some available to normal customers. However, Vida did indeed rush over to Noisette and buy some and she has left a comment here saying she thought the flavours were crap. What did you think Sticky? Each to their own I suppose Duncan. M.Menard's Macarons today had strong overtones of alcohol in the cream which may be what Vida didn't like. I loved them however, with the petit caffee being my favourite. I could inhale so many of them being such a light morsel. Although I love the nuts, I've never been a huge pistachio dessert fan so Mr S will eat that one and the coconut after dinner tonight. We will arm wrestle for the last one. For me patisserie generally overwhelms my palate, consequently I'm not a sweet tooth - many of Menard's offerings are an exception for me though. I cannot eat anything bitter and have not ever experienced this in his baking. So perhaps it takes a 'Supertaster's tongue' to savour the complexity of these particular macarons? Je n'sais pas, quel dommage - désolé Vida. These macarons are close to perfection in looks I think, from what Duncan has taught us all anyway through his posts. How much did each one cost Sticky? For anyone who reminisces about Macarons in the 'good old days' at Laurent, these should be similar, as Noisette is owned by their former head patissier - a 5th generation Breton Baker. Here's the translation Vida: "I don't know, what a pity, I'm sorry Vida." Most people don't realise that the cakes, pastries etc at Cacao come from Noisette and that the chocolates at both come from their commercial production kitchen in Port Melbourne. David Menard(Noisette) & Laurent Meric(Cacao) met whilst both were working for Laurant Boyllon's chain of stores(Laurant) along with Richard Reymond who was in charge of the savoury items. Wow...those are so yummy (and beatiful) looking! Thanks Melody! I loved your Flower Cupcake Tutorial on Sweet & Saucy. Y - his croissants are wonderful. Read my other post on Noisette here or by clicking Noisette's at the bottom of the post for a full description. Oh yeah! doh! I HAD read your other post regarding Noisette before! My boyfriend was in Melbourne for work recently - I should've gotten him to pop in and pick up a few things for me! Vida that's music to my ears. Duncan, it seems that the production kitchen for Noisette & Cacao has hit full stride so the Macarons and other morsels like pate de fruit and Madeleines are part of the daily offering. Interestingly I was at Hausfrau Bakery & Cafe in Yarraville today and noticed that they were selling Noisette's bread there too. The owners of Hausfrau are part of Australia's Paul Bocuse Restaurant Alumni. Lovely photo of macarons, indeed. They continue to fascinate me.